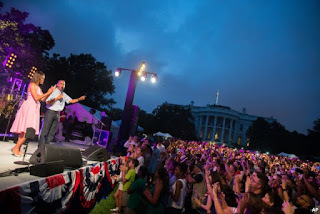 President Barack Obama, accompanied by first lady Michelle Obama, delivers remarks during an Independence Day celebration on the South Lawn at the White House in Washington, July 4, 2015. 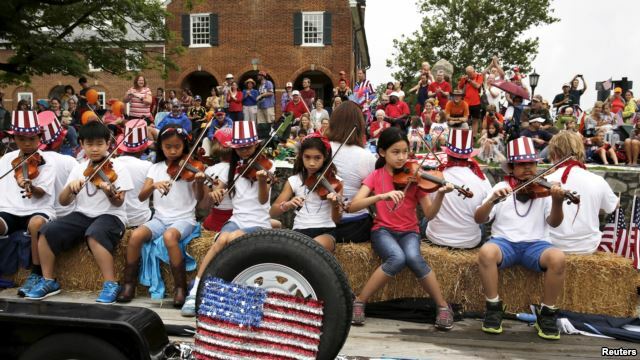 Across the United States on Saturday, Americans celebrated the 239th anniversary of their country's independence from Britain, as law enforcement officials boosted security following warnings about potential terrorist threats timed to the July 4 holiday. President Barack Obama wished all Americans a happy Fourth of July in his weekly address. The Obamas were due to host a "backyard barbecue" at the White House on Saturday for several hundred members of the military and their families. But the event was canceled because of bad weather. The military personnel and their families were invited to an event scheduled for later in the evening. At that event, Bruno Mars performed before Obama wished the crowd a happy Fourth of July. Outside Washington, CIA Director John Brennan spoke at a naturalization ceremony for 100 new citizens at Mount Vernon, the Virginia estate of George Washington, America's first president. Re-enactors portraying Washington and his wife, Martha, were also present at the site. Hundreds of thousands of people watched a concert and massive fireworks display on the National Mall on Saturday night. But those who arrived by midafternoon were forced to leave the Mall and wait out heavy thunderstoms at museums and metro stations nearby until the weather cleared. The concert featured Barry Manilow, Alabama, KC and the Sunshine Band, Nicole Scherzinger, Irish tenor Ronan Tynan and the National Symphony Orchestra. Extra law enforcement will be on duty for the weekend, and extra fencing and security checkpoints were put in place throughout the Mall. On Friday, New York Governor Andrew Cuomo ordered heightened security measures across the state over the long holiday weekend. "We are keenly aware that New York state remains a top target for terrorists," Cuomo said in a statement. New York City, which has the nation's largest municipal police force, assigned about 7,000 officers and nearly all its counterterrorism personnel to handle security around Independence Day events. Several U.S. presidential candidates took part in July Fourth parades in key early voting states. In New Hampshire, Jeb Bush, Rick Perry, Lincoln Chafee and Lindsey Graham marched in Amherst, and Hillary Clinton walked in Gorham. Bobby Jindhal walked in a parade in Urbandale, Iowa. Earlier this week, the Department of Homeland Security and the Federal Bureau of Investigation issued an alert calling for local authorities and the public to remain vigilant for possible threats following recent calls for violence by the Islamic State group during Ramadan. Terror attacks last week in Tunisia, Kuwait and France, in which dozens of civilians were killed, prompted U.S. 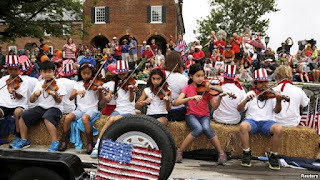 Homeland Security Secretary Jeh Johnson to issue a statement calling for increased vigilance over the patriotic holiday in the United States. The Islamic State group claimed responsibility for the Tunisia and Kuwait attacks. On July 4, 1776, representatives of the 13 American colonies officially adopted the Declaration of Independence that announced the severing of ties with Britain. The war for independence had already begun the previous year and would last until the Treaty of Paris in 1783, formally recognizing sovereignty for the United States of America. Although the Declaration of Independence states, "We hold these truths to be self-evident, that all men are created equal, that they are endowed by their creator with certain inalienable rights, that among these are life, liberty and the pursuit of happiness," the document was drafted by a slave owner, Thomas Jefferson, who later became the third U.S. president. Jefferson was not the only slave owner to sign the document. About one-third of the signers of the Declaration of Independence, from both the North and the South, owned or had owned slaves. Washington owned over 100. John Adams — the second president and Washington's vice president — was vehemently opposed to slavery. The issue was not settled until the Civil War ended nearly 80 years after the signing of the Declaration of Independence.